It’s been a while now that I’m mainly taking mobile photos, in that I mean pictures with my iPhone, on that note I must say the iPhone 6 camera is rather stunning. While I love the feeling of a DSLR, the sound of the mirror, the viewfinder, reviewing the photo afterwards, zooming in to see if it was sharp enough, setting and adjusting the tripod . All these unique feelings to working with real photography I love. But I just don’t have the time anymore. So I figured I might as well make mobilephotograpy or iphoneography as it is sometimes (discriminately) called, a real thing. I travel quite a lot and try to take one great picture in every city I go to. I normally do the post processing on my iPhone in the plane or in the subway. It’s a great way to spend time and feel like it’s not wasted time. 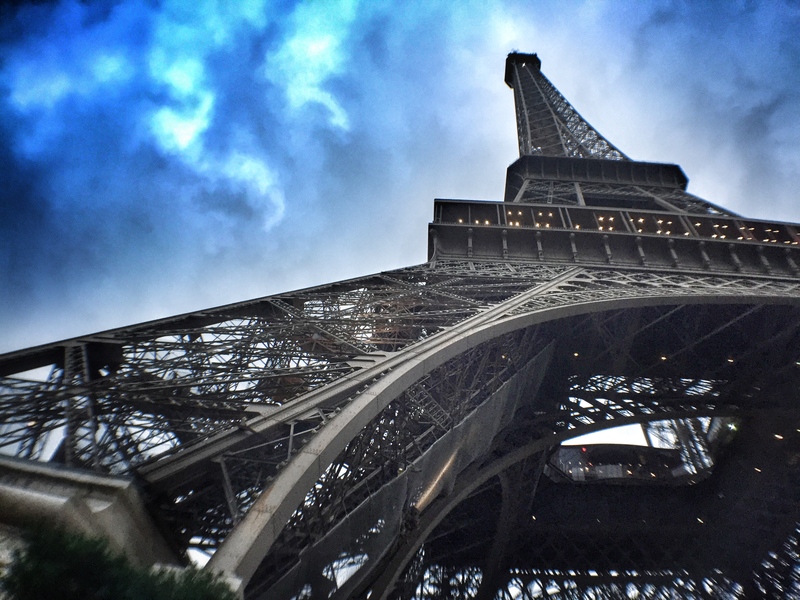 Eiffel Tower taken with an iPhone6 and a wide angle Pocket Lens. I’ve also recently been playing around with a wide angle and macro lens called Pocket Lens. As I never wanted to invest $100 into an Olloclip, I’ve been looking for an alternative solution. It is a compromise, but for $25 it’s an OK compromise. The wide angle lens has some distortion on the edges but no black “barrels” from the lens itself. Other than that it’s pretty good. This Eiffel Tower photo was shot with a Pocket Lens, it hasn’t been cropped so you can see the level of distortion. The photo was taken inspired by one of Serge Ramelli’s pictures of the Eiffel Tower, I think it came out pretty good for mobile photo. Eiffel Tower is particularly hard to shoot, not only because it’s been shot to death but also because it’s size means you can hardly ever get a good landscape photo of the tower unless you are far away and then it’s pretty useless – honestly it just looks like some average joe’s tourist photo. This photo was taken at the base of the tower but is only possible with a wideangle lens, and the iPhone’s natural lens isn’t wide enough. Color version of the Eiffel Tower photo. Taken with Pocket Lens and an iPhone 6. I post processed the image using Snapseed only, both in Color and in Black and White. The advantage of shooting with mobile phones and an attachable lens is that one can still have the pleasure of shooting some great images withouth having to hold up the ensite family with the set-up and take down of the equipment. More mobilephotography or iphoneography pictures will be coming. Meanwhile you can check out my Flickr page in the menu above. 10 Dec	This entry was published on December 10, 2014 at 10:30 am. It’s filed under black and white, Buildings, HDR, iPhone, Landscape, Monument, Paris, Parisian Classic, photography and tagged Building, Buildings, Eiffel Tower, HDR, iPhone, iphoneography, Paris, paris hdr, Parisian Classic, photography, photos. Bookmark the permalink. Follow any comments here with the RSS feed for this post.